On Sunday, President Obama gave a speech at Xavier University in New Orleans, marking the five year anniversary of Hurricane Katrina. I’ll be teaching about Hurricane Katrina to undergraduates this semester, so I’ve been reading and thinking about the scholarship on Hurricane Katrina and race at this milestone. 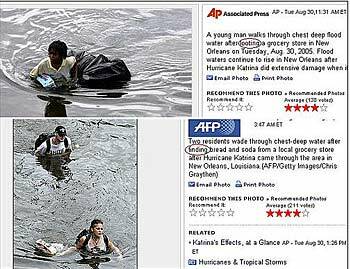 Sociology – The sociology on Hurricane Katrina and its aftermath highlights the intersection of race, gender and class. Sociologists contend that the inequality that existed before prior to the disaster, became intensified and deepened in the aftermath of the storm. Further, sociologists point out the way that this rupture in the usual “colorblind” ethos that prevails in the U.S. served to strengthen whites’ racial apathy toward blacks, especially those who are economically impoverished. Brunsma, D., Overfelt, D., and Picou, J.S. (Eds.). 2007. The Sociology of Katrina: Perspectives on a Modern Catastrophe. (Lanham, MD. : Rowman & Littlefield). Dyson, M.E. 2006. Come Hell or High Water: Hurricane Katrina and the Color of Disaster. (New York: Basic Books). Hartman, C.W. and Squires, G.D. (Eds.). 2006. There is no such thing as a natural disaster:race, class, and Hurricane Katrina. (New York: Routledge). Forman, T.A. and A.E. Lewis. 2006. “Racial Apathy and Hurricane Katrina: The Social Anatomy of Prejudice in the Post-Civil Rights Era,” [pdf] Du Bois Review 3 (1): 175-202. Environmental / Urban Studies – Urban and environmental studies examine the ways that the built environment shaped the disaster and the ways that environmental hazards are concentrated in minority communities. In addition, those who look at the disaster through an urban studies lens explore the process whereby local economic elites are seeking to make an opportunity of the destruction by monopolizing the planning process and rebuilding the cityscape in a fashion more amenable to the accumulation of capital. BondGraham, D. 2007. “The New Orleans that Race Built: Racism, Disaster, and Urban Spatial Relationships,” Souls 9 (1):4-18. Bullard,R.D. and Wright, B. 2009. Race, Place, and Environmental Justice After Hurricane Katrina: Struggles to Reclaim, Rebuild, and Revitalize New Orleans and the Gulf Coast. (Boulder, CO.: Westview Press). Campanella, R. 2006. Geographies of New Orleans: Urban Fabrics Before the Storm. (Lafayette, LA: Center for Louisiana Studies). Park, Y. and Miller, J. 2006. “The Social Ecology of Hurricane Katrina: Re-Writing the Discourse of “Natural” Disasters” Smith College Studies in Social Work 76 (3): 9-24. Public Health -Psychology-Mental Health – Psychologists along with public health and mental health professionals examine the impact the disaster had on individual mental health. One study (Galea, et al., 2008) found that women, and those who had suffered significant financial loss following the disaster, were more likely than men or those who didn’t suffer significant financial loss, to experience PTSD after the storm. Chen, A. C. Keith, V. M. Leong, K. J. Airriess, C. Li, W. Chung, K. Y. Lee, C. C. 2007. “Hurricane Katrina: prior trauma, poverty and health among Vietnamese-American survivors.” International Nursing Review 54 (4):324-331. Krol, D. M. Redlener, M. Shapiro, A. Wajnberg, A., 2007. “A Mobile Medical Care Approach Targeting Underserved Populations in post-Hurricane Katrina Mississippi,” Journal of Health Care for the Poor and Underserved 18 (2): 331-340. Chen, A. C. Keith, V., Airriess, C., Wei, L. and Leong, K. J. 2007. “Economic Vulnerability, Discrimination, and Hurricane Katrina: Health Among Black Katrina Survivors in Eastern New Orleans.” Journal of the American Psychiatric Nurses Association 13 (5):257-266. Galea, S., Tracy, M., Norris, F., Coffey, S. 2008. Financial and social circumstances and the incidence and course of PTSD in Mississippi during the first two years after Hurricane Katrina. Journal of Traumatic Stress 21 (4): 357-368. Vigil, J.M. Geary, D.C. 2008. “A Preliminary Investigation of Family Coping Styles and Psychological Well-Being Among Adolescent Survivors of Hurricane Katrina,” Journal of Family Psychology 22 (1):176-180. White, I. K. Philpot, T. S. Wylie, K. McGowen, E. 2007. “Feeling the Pain of My People: Hurricane Katrina, Racial Inequality, and the Psyche of Black America,” Journal of Black Studies 37 (4): 523-538. Media / Communications – Communications and media scholars focus attention on the ways that the mainstream media framed the disaster for television audiences and newspaper readers. Study after study demonstrates that, as Tierney et al. demonstrate, “metaphors matter.” As the image above illustrates, race played an important role in the ways that the stories from the disaster were told. Spence, P.R., Lachlan, K.A., Griffin, D. 2007. “Crisis Communication, Race, and Natural Disasters,” Journal of Black Studies 37 (4): 539-554. Tierney, K. Bevc, C. and Kluigowski, E. 2006. “Metaphors Matter: Disaster Myths, Media Frames, and Their Consequences in Hurricane Katrina,” The ANNALS of the American Academy of Political and Social Science 604 (1):57-81. Danzinger, S and Danzinger, SK. 2006. “Poverty, Race and Antipoverty Policy Before and After Hurricane Katrina“[pdf] DuBois Review: Social Science Research on Race 3:23-36. Henkel, K.E., Dovidio, J.F., and Gaertner, S.L. 2006. “Institutional Discrimination, Individual Racism, and Hurricane Katrina,” Analyses of Social Issues and Public Policy 6 (1): 99-124. Marabel, M. and Clarke, K. (Eds.). 2008. Seeking higher ground:the Hurricane Katrina crisis, race, and public policy reader. (New York: MacMillan). Muñiz, Brenda. 2006. In the eye of the storm: how the government and private response to Hurricane Katrina failed Latinos. [pdf] Report, National Council of La Raza. Stivers, C. “So Poor and So Black”: Hurricane Katrina, Public Administration, and the Issue of Race,” [pdf] Public Administration Review 67 (1):48-56. I’m sure there’s good research I’ve overlooked in this brief list. If I’ve left out some of your research, or some that you know of and use, please add a comment and I’ll update the original post. Brock, A. (2007). “Race, the Internet, and the hurricane: A critical discourse analysis of Black identity online during the aftermath of Hurricane Katrina”. Doctoral dissertation. University of Illinois at Urbana-Champaign. Yes, thanks for the round-up. It’s given me lots of reading to do! And thank you, too, DocDre. There’s also an interesting article on the experiences of adults with sickle cell in New Orleans in the aftermath of Katrina..I’ll get the specific citation and post it here. Karras NA, Hemenway CS. Hurricane Katrina’s impact on pediatric and adult patients with sickle cell disease. J Health Care Poor Underserved. 2007 May;18(2):382-93.